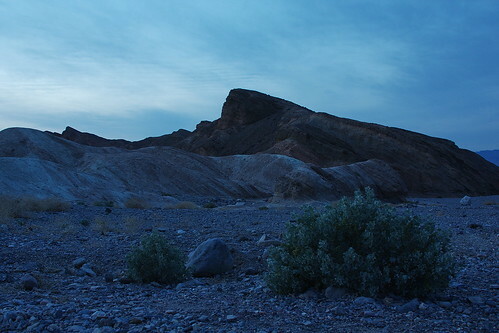 Death Valley, originally uploaded by The Bacher Family. Here's a classic view of Death Valley, from our final full day in the park. This view is from the mouth of Natural Bridge Canyon, looking down over the lowest part of the valley and up at the highest point in the park in the distance, Telescope Peak--a vertical difference of more than 11,000 feet. Later this afternoon, the winds kicked up in the valley, obliterating this view completely in a massive dust storm. In fact, you can already see just a hint of haze on the distant mountains. Welcome to Scotty's Castle, originally uploaded by The Bacher Family. Like so many places in Death Valley National Park, "Scotty's Castle" is larger than life: built as a vacation home by wealthy entrepreneur Albert Johnson, but popularized by the antics and stories of Walter Scott, better known as "Death Valley Scotty." Scotty was, by various accounts, shrewd, inventive, or downright crooked--and those who knew him best would have allowed all three. He rode for a time with Buffalo Bill, mined borax, and claimed to have found the mother lode of gold, a venture that attracted investment dollars from Mr. Johnson. 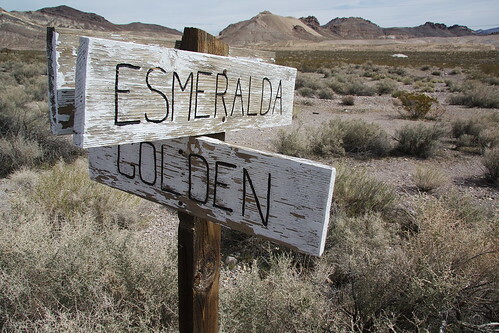 The fact that there was no gold eventually became clear, but by then Johnson and Scotty had become unlikely friends, and Scotty was a frequent and welcome guest in the home Johnson built in the Spanish Colonial style on an oasis east of Death Valley. 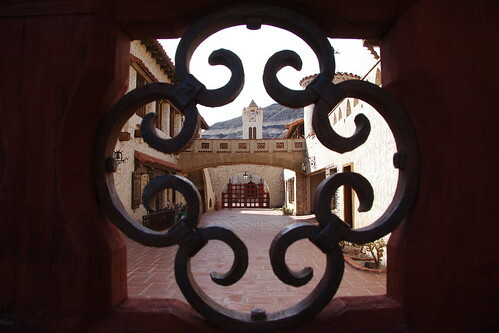 Johnson said Scotty repaid his investments in laughs, and he encouraged the fable that his "Death Valley Ranch" was actually "Scotty's Castle." Today, the Park Service provides daily tours of the property, and you can see the beautiful and intricate workmanship as well as the progressive use of technologies like hydroelectric power, indoor plumbing, and electric lights. Panoramic Leadfield, originally uploaded by The Bacher Family. The old mining town of Leadfield is a classic story of boom, bust, and swindle. The story goes that the original claim was promoted by C.C. Julian in 1925, who claimed to have found abundant veins of lead and other minerals in the desert mountains. Promotional posters showed steamboats making their way up the Armagosa River, which is, in reality, usually dry and flows nowhere near Leadfield. A road was built into the site, and for a time, the town swelled to 300 people and a post office. Within a year, reality set in and everyone left, leaving the town as empty of people as it was of marketable ore. Julian disappeared with his profits. Today the site is reached by a fifteen mile trek up a 4-wheel-drive road. 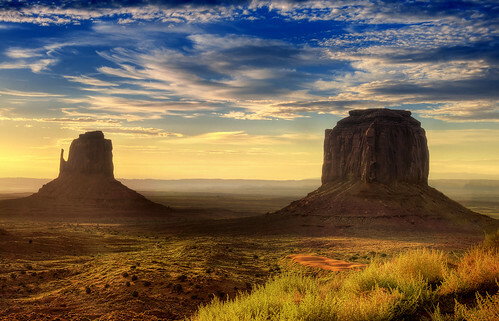 To me, it seemed a beautiful site, with wide sky, great views, and abundant solitude, broken only by the sounds of desert birds, a larger-than-life landscape perfect for a panoramic image stitched together from five regular-sized shots. The frosting monster, originally uploaded by The Bacher Family. 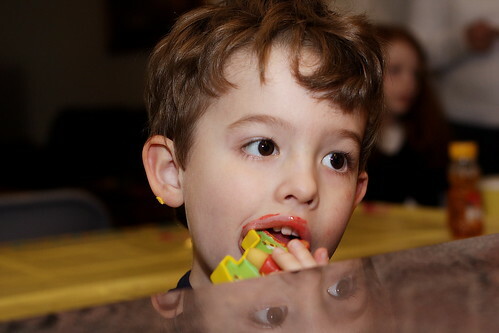 At his brother Matthew's first birthday party, Thomas scored the candle to lick free of frosting. He ended up smeared with it like bad lipstick, and how he ended up with some on his ear is a mystery! I shot this photo across the marble countertop, not even noticing until after the fact that Thomas's eyes were reflected in the polished surface. Esmeralda and Golden, originally uploaded by The Bacher Family. The town of Rhyolite was once one of the largest mining towns in western Nevada, with a few thousand souls busy mining silver from the nearby hills, or selling goods and services to the miners. It only lasted a few years before the boom went bust; today, all that remains are a few crumbling buildings, a smattering of tourists, and street signs evoking the vocabulary and dreams of a bygone era. Maestro, originally uploaded by The Bacher Family. As I photographed David's band concert last night from the bleachers at Eatonville Middle School, I captured--entirely by accidental timing--a photo of band director Susan Danielson with her arms outstretched, leading the band into a musical phrase. I liked it so much, I spent the next five minutes trying to replicate it again, anticipating when the moment would occur and snapping the shutter at the precise moment. Finally, success! -- and when I downloaded the photos at home, it was clear that the effort had paid off, because the second photo was superior to the first. 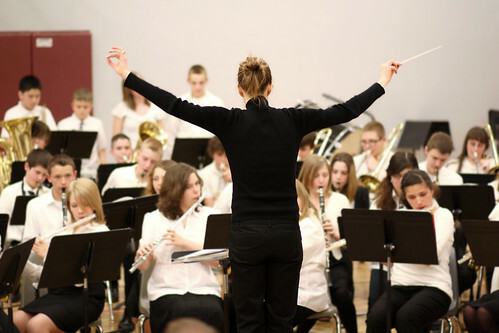 I love this portrait of a Middle School band director at work in her element. I think I prefer the color version to the black and white one, though you can decide for yourself. 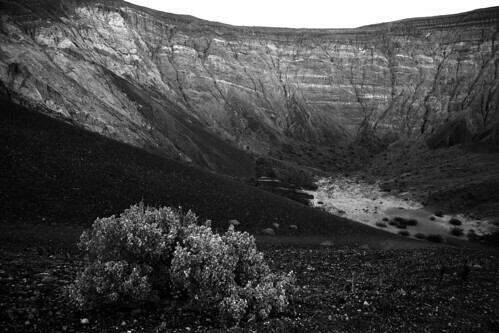 The black and white image is below. Growing salt, originally uploaded by The Bacher Family. 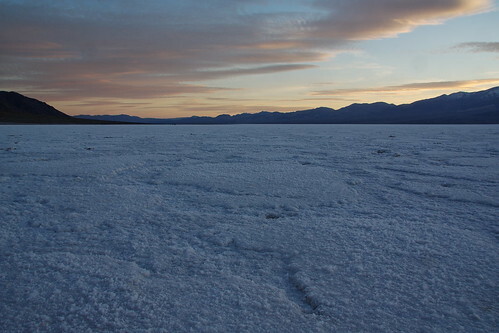 Once you get away from the places that have been trampled by the constant stream of tourists at Badwater, you begin to see the real nature of the salt flats. Get down on your belly and look close, and this is what you see: not salt crystals, but salt filaments, twisted up like fluffy piles of -- what? I'm not even sure what to compare it to. But it is uniquely beautiful. I shot this by the light of the setting sun, which had already disappeared behind the mountains, leaving only a thin blue highlight on the surface of the salt to contrast with the pale warm light on the distant clouds. Badwater, originally uploaded by The Bacher Family. 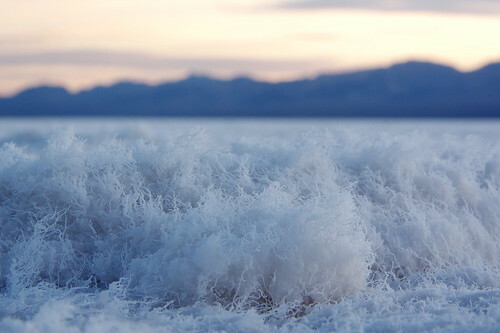 Badwater, California: the lowest place in the western hemisphere, 282 feet below sea level in Death Valley National Park. 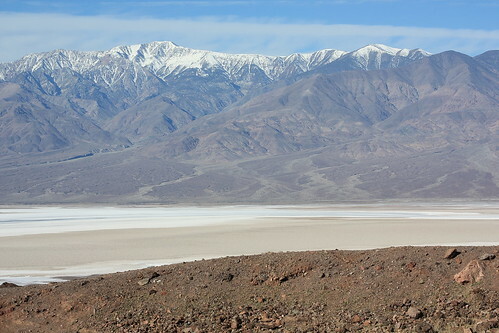 Intermittently flooded by runoff from the surrounding mountains during the desert's rare but violent rainstorms, the evaporating water, with nowhere to drain, leaves behind crystaline deposits: carbonates, borax, and especially salt. We drove to Badwater one evening for the sunset, forgetting that the best light would actually be an hour before sunset--at such a low elevation, the sun goes down behind the western mountains long before it sets over the distant ocean. Still, the light of dusk cast the salt flats in a moody blue light, while the sky reflected the colors of the setting sun. You have to walk waaay out into the flats to get away from the paths trampled by the hundreds of people who visit every day. When you do, you're rewarded with foregrounds that still show the crystaline encrustation of eons of salt deposits. From there, the rules of photography are simple: use a tripod; keep the camera low, the angle wide; observe the rule of thirds; and keep the horizon level. 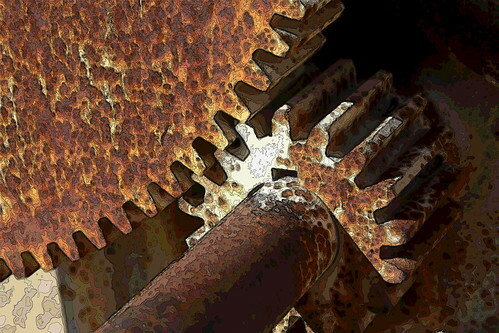 The gears of progress, originally uploaded by The Bacher Family. At Furnace Creek Ranch in Death Valley National Park is a museum of the early mining history of the area. I don't even remember what piece of machinery this was part of, but I was attracted by the marvelous pattern of gears and cogs, and the pattern of rust coating everything. You can see the original photo here, but I thought the image looked even better with a bit of stylization to emphasize the industrial appearance; hence, the "contour" post-processing. 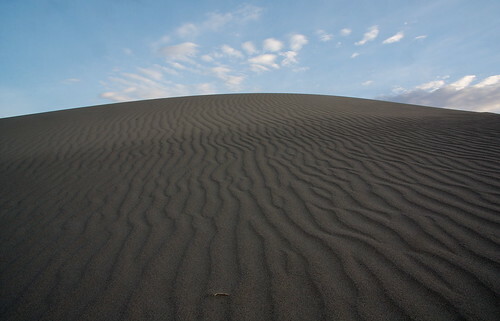 The sand dunes of Mesquite Flats, originally uploaded by The Bacher Family. As the sun came up in Death Valley, the light over the Mesquite Sand Dunes was absolutely gorgeous. I loved the way the side lighting emphasized the wind ripples on the dunes, and how, if you shot from a low angle, the dunes seemed to go on forever. This ones shot with a classic "thirds" composition, with a bit of debris center-foreground and a nice smattering of clouds in the background to attract the eye and pull it deep into the photo, respectively. It all makes, for me anyway, a really nice shot. Elk herd in Ashford, originally uploaded by The Bacher Family. As I was driving home from work yesterday, I passed this herd of elk in a field just east of Ashford. I turned around at the first opportunity and spent ten minutes snapping photos out of my "photo blind," i.e. my car parked along the side of the road! I got some great shots--to see the entire set, click here--but this one's my favorite, with the old elk standing with her ruff fluffed up agains the cold and the snow falling all around. Another day, originally uploaded by The Bacher Family. 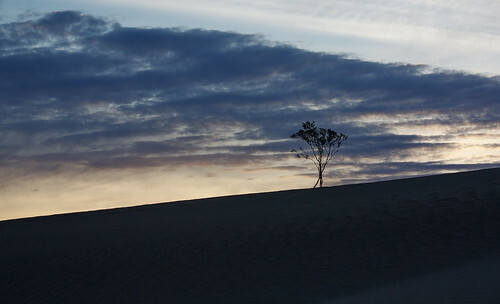 One of my favorite sunrise photos from our trip to Death Valley is this image of a... what, tree? shrub? bush? silhouetted against the morning sky at Mesquite Dunes. I love the smooth curves of the sand in the foreground, the similar sweep of clouds in the background, with just a hint of color from the not-yet-risen sun, and that solitary plant clinging to life at the top of the dunes. I took several versions of the photo, shooting fast while the light held; this one's my personal favorite. I shot RAW, so I could adjust the exposure; truth be told, I'm still fiddling with it, experimenting with different settings. What do you think? 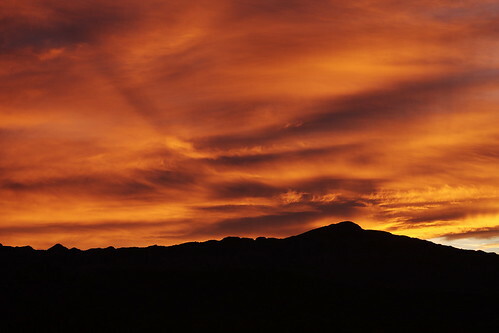 Sunrise over Mesquite Dunes, originally uploaded by The Bacher Family. Our first morning in Death Valley, Kelli and I woke before dawn and drove north in the dark to Mesquite Sand Dunes, on the recommendation of several friends. We were not disappointed! The sunrise was absolutely spectacular, with the sky alight with fire over the undulating patterns of sand. I was very glad for my wide angle lens! Zabriski by dusk, originally uploaded by The Bacher Family. Our first evening in Death Valley, we drove up to Zabriski Point for the sunset. The colors were fabulous, though perhaps not as extraordinary as they are some nights; I shared my perch with only half a dozen or so other photographers. My favorite photo of the whole evening, in fact, was this one, taken as I walked back to the car. With the bright, warm colors of sunset below the horizon, the cool, dark colors of dusk set in, and the landscape looked so stark and beautiful that I had to set down my camera, still on the tripod, and snap a picture. Looks like enchantment, originally uploaded by The Bacher Family. At the end of February, I flew to Nevada for three days of training at Lake Mead National Recreation Area, then met my wife Kelli in Las Vegas, rented a car, and drove to Death Valley for four days of vacation. 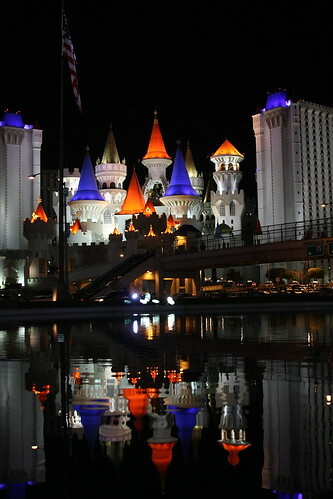 Kelli and I spent a couple of hours, the night she arrived, walking "the strip," experiencing the sights and sounds. Looking back at my photos from that evening, I'm struck by how peaceful most of them look. The majority of them were shot over the heads of the crowds, at the brightly-lit attractions that soar into the night sky. I seem to have had little inclination to document the press of humanity, or the seedy billboards, or the street vendors on every corner trying to press advertisements for GIRLS! GIRLS! GIRLS! into our hands as we walked by. 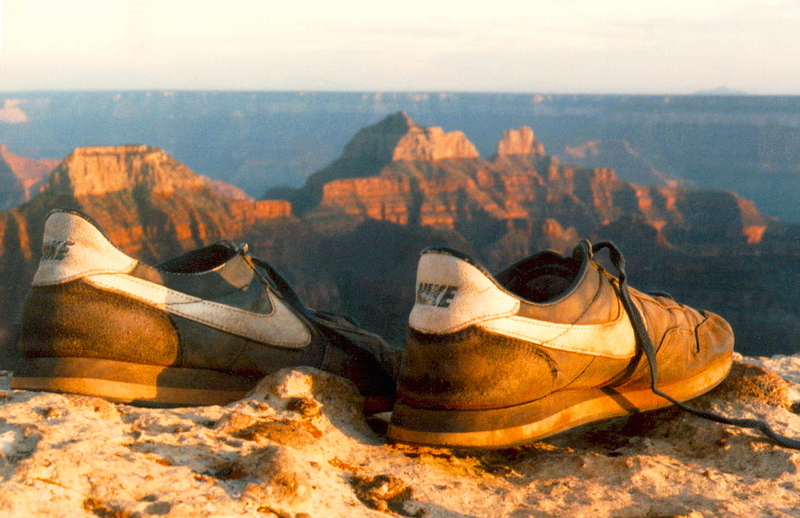 It's impressive, in a way, that I was able to find so much real beauty in such a sordid place. Tooth and claw, originally uploaded by The Bacher Family. I opened our shades this afternoon to find no birds at the feeder and feathers scattered all over the place. "Cat" always comes to mind, but no, this was another appearance of our neighborhood Cooper's Hawk, who comes to feed at our feeder every so often (once as we were eating breakfast ten feet away!). Caught red-handed, Mr. Cooper wasn't the least bit concerned about anything but the feathers, which he systematically plucked and scattered in the wind. Then, his meal of mourning dove fully prepared, he flew away with it to dine in private. I think Lord Tennyson's a bit harsh, myself. 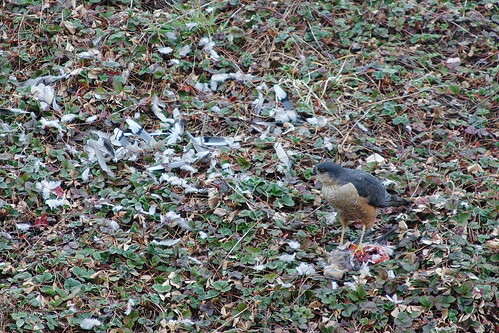 A hawk's gotta eat too. Spring, soon..., originally uploaded by The Bacher Family. On these dreary winter days, one looks for signs of spring wherever one can find them. 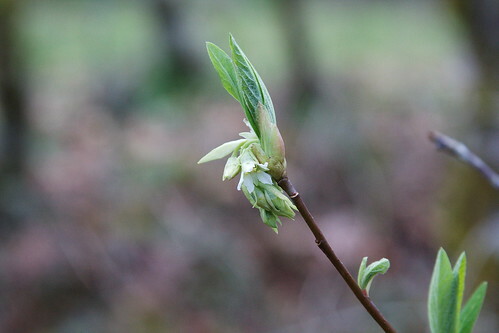 This photo was taken February 22 in Smallwood Park, here in Eatonville; even now, three weeks later, it's still one of only a few plants that have ventured cautiously and hopefully into bloom. Spring is officially only a week away, though, so I'm hopeful that more will follow. 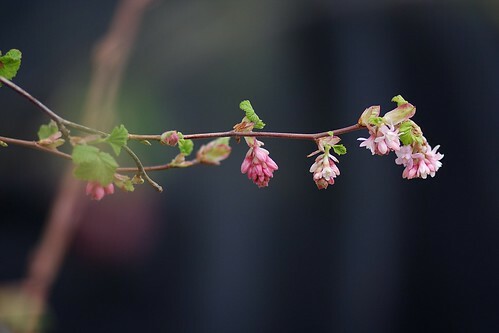 The lighting was dim for this image, but I set my f-stop carefully to give just enough depth of field to ensure the flower and buds were in sharp focus, while leaving the background splendidly blurred. I love the delicate colors, too. Japanese volunteer at Mount Rainier, originally uploaded by The Bacher Family. In the wake of last night's massive earthquake in Japan, my thoughts (and prayers) keep turning to the many people I know who either live in Japan or have family and friends there. As the volunteer program manager at Mount Rainier National Park, I think particularly of the members of the Japan Volunteers-in-Parks Association (JVIPA). Every year, anywhere from one to two dozen volunteers come to Mount Rainier National Park from Waseda University in Tokyo, Japan through JVIPA. They do work on trails, maintenance projects, restoration sites, wherever they're needed, and stay with host families in the community, most of the park employees. Over the years they've contributed thousands of hours of volunteer service, and enriched our lives with their friendship. At the end of every term, the students host a farewell party for all involved, and cook traditional Japanese food to share. In 2007, the group also came prepared to dress in traditional Japanese garb. Here are two photos from that event. Click here for more photos of JVIPA students over the years. As of this writing, I've heard from a few friends in Tokyo who are doing fine, but there are many others I have yet to hear from. Japanese Volunteer, originally uploaded by The Bacher Family. Matthew alight, originally uploaded by The Bacher Family. 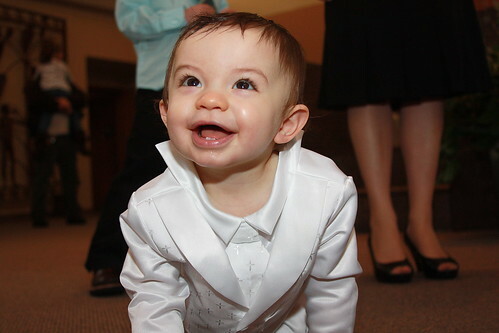 I love this photo of my nephew Matthew, taken a few minutes after his baptism in Olympia. 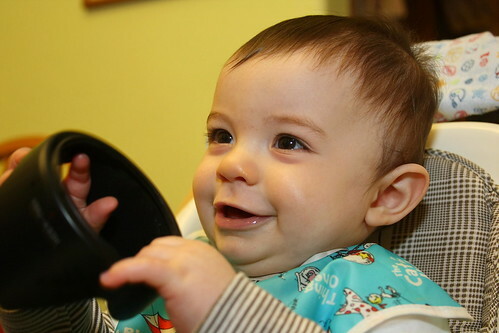 He is such a happy child, and tolerated the odd sensations of water and pungent oils with curiosity and good humor. Afterward, he had a good time exploring at his own level. I got down on his level myself to take the picture, and in fact just held the camera low, made a guess at the right aim, fired off a couple of shots, and got splendidly lucky. IMG_7416_1, originally uploaded by The Bacher Family. At the end of February, I flew down to Las Vegas for three days of training at Lake Mead National Recreation area, and drove up to Valley of Fire State Park to see the sights. As extraordinary as the terrain was, the most gorgeous sight of all was the sky on my way out in the evening. I literally pulled the car over and snapped a bunch of photos. "Valley" of fire? This day, the sky was the most on fire part of the landscape! 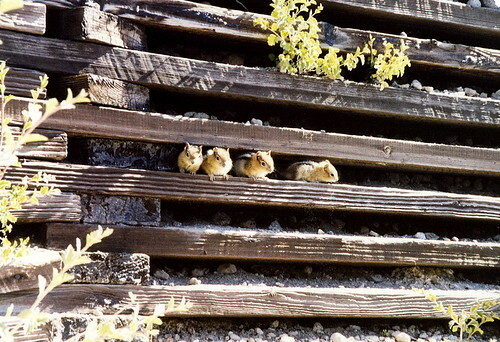 Four baby groundsquirrels, originally uploaded by The Bacher Family. There are moments in life when you're just grateful you had a camera with you. We spotted this in the rock retaining wall on the Cleetwood trail at Crater Lake National Park as we here hiking down to the water. I took the best photo I could from a distance, wishing I had a longer lens, but not wanting to get any closer and spook the little critters--and indeed, when I did step closer, they vanished as if they'd never been there. I may wish for a better version of the photo, but I'm grateful to have captured what I did! 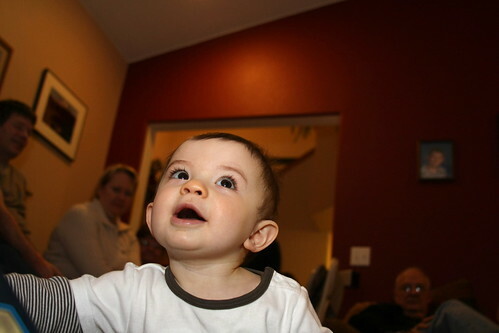 Matthew, looking up, originally uploaded by The Bacher Family. Matthew was very active at David's birthday party, crawling around and investigating every present, both wrapped and unwrapped. I had a great time following him around and snapping photographs. I especially like the point of view on this one, shooting not only from Matthew's level, but below it, even as he looks up. It has a very uplifiting feel for me, and I love the way the lighting turned out. Sammy, originally uploaded by Just Andy - It's all about the grain. Andrew Lynch is one of those great photographers who takes really nice traditional portrait photographs -- but can also be counted on, on a regular basis, to come up with something just unique enough to make you take a second look. 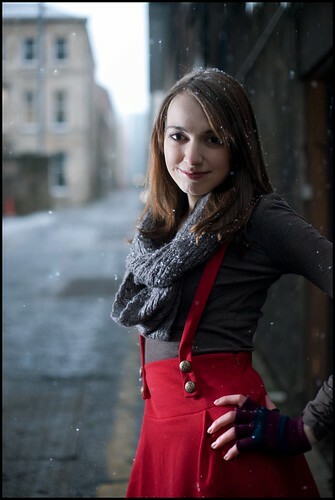 This photo's a good example--outside, not in a studio; with a light snow falling around her; off-center in the frame of the photo, with that long, deserted street behind her, daring you to look past her; but with that bright red skirt and perfectly-lit face pulling your eye in. Nicely done. Happy ending, originally uploaded by The Bacher Family. I took this photo at a family Christmas gathering. Bodie was such a cute little ham! I love the expression on his face. A friend suggested the title for this photo, imagining, in his own mind, what might have been going through Bodie's at this moment. Matthew at David's birthday party, originally uploaded by The Bacher Family. Matthew is always a good photo subject, with his big, dark eyes and candid expressions. 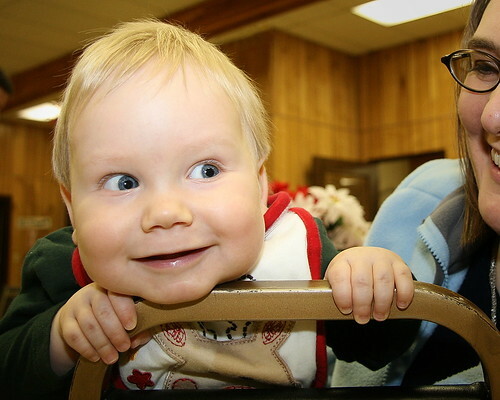 I took this photo of him at David's birthday party in January 2011. 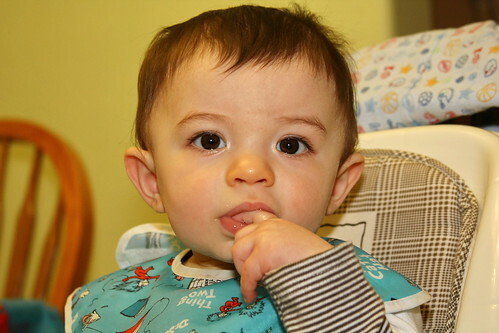 Why do infants always look like they have yellow noses in my photos? Just for fun, I gave Matthew my len hood to play with as I snapped photos of him. It worked great -- it made him smile, gave him something interesting to do (i.e. slobber all over), and added some action to the shots. Matthew and the lens hood, originally uploaded by The Bacher Family. ., originally uploaded by Michael Dörr. For some photographers, a dreamlike quality permeates their work. 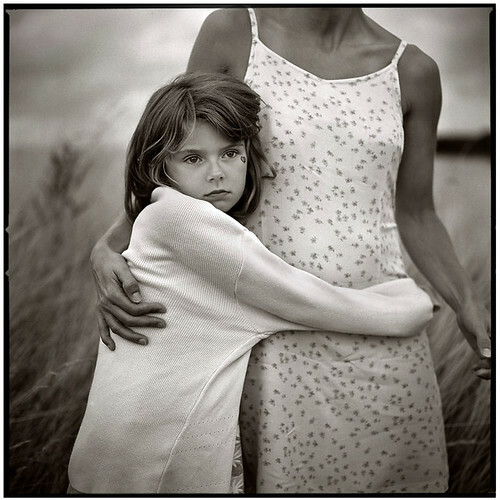 This is certainly the case with Michael Dörr, especially in his back and white photography. It's less a case of subdued reality, though, than hyper-reality, in which layers of meaning become visible, at least intuitively, in the expressions on his subjects' faces, the way the light shines on them like an aura. I'm not exactly sure how he achieves this feat, but I certainly love looking at it. Wedding Dreams, originally uploaded by The Bacher Family. In honor of my wife's and my 15th wedding anniversary, one of my favorite wedding photographs! The wedding of a friend was held in an old theater in Puyallup, Washington. 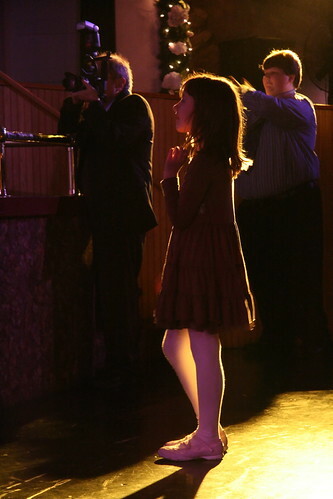 As the couple came out on the stage to be presented, I looked to the side and spotted this young girl, backlit, watching the stage with rapt attention. She was far more interesting than the bride and groom right then. I hope, someday, that her own wedding is as beautiful as she's imagining it to be in this moment. Mary with open arms, originally uploaded by The Bacher Family. I must have looked pretty funny taking this picture, lying on the ground on my back in front of a statue of St. Mary, looking up with a camera. Still, the result was pretty fantastic. I wish I'd have had a slightly wider angle lens, but I wouldn't have wanted more than another millimeter or two, because I wouldn't have wanted the soaring steeple and cross to receed much further into the sky. I bracketed the exposure on this and shot RAW in order to get the best balance of light on the dark statue in the foreground and the bright church in the background. This picture is taken at St. Mary's Catholic Church in Albany, Oregon. For several generations, a magnificent historic church stood on this site, till it was burned down in an act of vandalism by a vagrant in 1992. 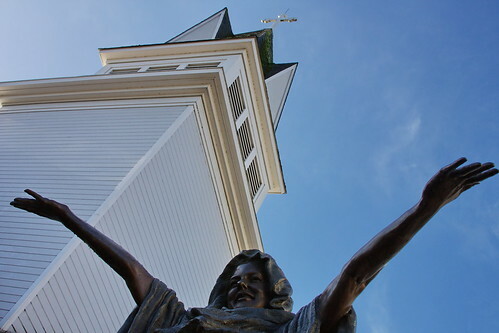 This new structure, modern but reminiscent of the old one, took its place, along with the statue of Mary, welcoming all with open arms despite the past actions of one individual. St. Mary's still has one of the most active missions to homeless people in the Albany area.